A small city located just outside of the Seattle area, Bothell has the friendly small-town atmosphere that invites visitors to sit back and enjoy the scenery. Bothell has just about 34,000 residents with gorgeous weather throughout the year. The city provides guests with plenty of entertainment utilizing its Music in the Park concert series and Freedom Festival to attract visitors from all over the world. The city also provides plenty of dental clinic choices when you have a dental emergency. From dental specialists like orthodontists and surgeons to general dentists who provide routine care, Bothell gives you exactly what you need when you are seeking immediate dental care. The Emergencydentistsusa.com website is the perfect starting point when you decide to select a new Bothell dentist or when you are simply seeking an emergency dentist right now. Our convenient website allows you to scroll through the hand-chosen local dental clinics and select the dentist who suits your needs. You can find driving directions, office hours, specialties, and even services offered right on the Emergencydentistsusa.com website. Click on the dentist who interests you, and set up an appointment to get out of that dental pain immediately. When you do not have access to the internet or need a little more help choosing a new dentist, our dentist finder hotline is a great choice. Simply call the 24-hour dentist finder hotline to speak with a friendly agent who can help you to select an emergency dentist without the hassle of searching all over town. Use our services to set up your first dental appointment and get driving directions to your new dental clinic. Remember to bring your dental insurance card, a photo ID, and any necessary dental copayment with you to the first office visit. Arrive at least 10-15 minutes prior to the appointment to fill out the new patient paperwork. A small town atmosphere with big city dental options makes Bothell, Washington a wonderful city when it comes to dealing with a dental emergency. From holistic dental offices to dental surgeons and orthodontists, this city provides you with all of the dental services that you require without having to travel to Seattle. In most cases, choosing a general dentist means getting the dental care that you need and the option for a referral to a dental specialist if necessary. Description: A caring staff and two excellent dentists bring compassion to Sobczak Wencel Dentistry. From routine cleanings to full mouth restorations, this dental office provides all of the services that any patient might require. Helping you come to an informed decision about your dental care is a priority at this Bothell dental office. Description: A full service dental clinic makes each visit a pleasure. A kind and caring staff provide plenty of support to the two amazing dentists at Boriotti and Schwark. Performing all types of dental services including routine examinations, digital x-rays, cleanings, fillings, and implants makes this dental clinic a great choice for anyone starting down the road that includes excellent dental care. 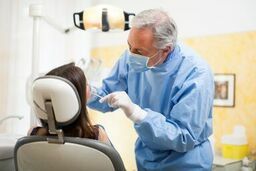 Description: Offering a huge selection of dental services including routine cleanings, implants, and dentures, Crisafulli Dental is a great option for anyone seeking a new dental experience. A team of kind and compassionate doctors and a wonderful staff make this dental clinic an excellent choice for the entire family. State-of-the-art technology in a calm atmosphere are what sets Crisafulli Dental apart from the standard dental clinic. A painful toothache can definitely ruin any day. If you are experiencing a painful toothache for more than one to two hours, it is important to make an appointment to see your Bothell dentist as soon as possible. A toothache that stems from an accident or an injury might include more serious injuries. In this case, you should call 911 or head to your nearest urgent care center or hospital for immediate medical attention. A broken tooth or a tooth that is knocked out can be repaired in a dental clinic, but a more serious injury requires a visit to the hospital or urgent care center immediately. When you choose a new Bothell dentist, it is a great idea to check his or her licensing and credentials in order to ensure that this dentist is currently licensed in your area. You can do this by visiting the dental clinic and speaking to the receptionist. Most dentists keep a copy of their current licensing on file with their office. You can also use the Washington Dental Association website to check current dental licensing. Just visit the website and type your dentist’s name into the search box to take a look at his or her licensing information.